INDUSTRY.co.id - Jakarta - The increasing demand of Fuel (BBM) and Liquified Petroleum Gas (LPG) at Idul Fitri 1439 H continues to be monitored by the Government. Ministry of Energy and Mineral Resources (ESDM) through the National Post Team of ESDM Sector directly review the potential points of fuel and LPG surge in some cities. Tuesday (6/19/2018), led by Chairman of the National Sector of EMR Sector, Fansurullah Asa, and post team along the Batang-Semarang toll road. "Monitoring of EMR National Team Post at Pertamina Area of ​​Candi Areng KM 344 ​​on Tuesday afternoon at 17.50 WIB and previously at Kiosk Pertamina KM 407 at around 17.05 WIB, all went well and safely under control," said Fansurullah Asa, who is also Chairman of Downstream Regulatory Agency Oil and Gas (BPH Migas) from Batang-Semarang toll road. Meanwhile, reported from Serang, post team visited the gas station 34.42108. Jl Raya Serang Jakarta Km 4.5 Parung Serang City, which is a reborn station, revealed that the premium stock on June 19, 2018 at 14:40 pm as many as 7,788 liters. Overall fuel stock is safe. 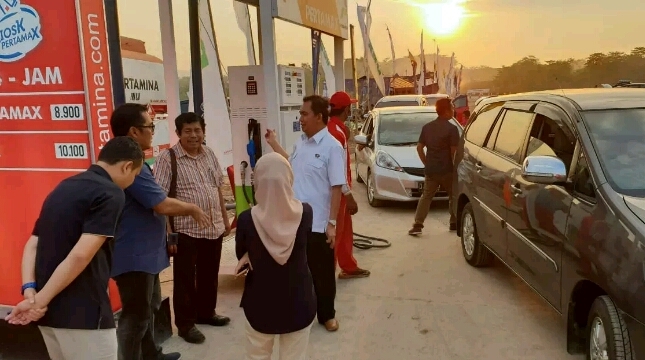 On the same day, in order to secure the supply of 3 kg LPG cylinders, the Serang post team visited the LPG base up to the suppliers and sub-dealers. "Some of the points we monitored directly, the overall distribution of LPG 3 kg in Serang City both before and after Idulfitri smoothly," said Director of Oil and Gas Downstream Business Development Ministry of Energy and Mineral Resources, Yuli Rachwati, reported from Serang (19/6/2018). He mentioned that PT Hasanah Karya Mandiri Agent Jl Takari Kampung Jakung Legok Serang City is the largest 3 kg LPG agent in Serang City, distributing 3 kg LPG to 94 bases. "Normal distribution is around 20 tons per day," said Yuli. "During Idul Fitri increased to 27 tons per day. The next visit to Wahyullah M base on Jl. Takari Kampung Jakung Legok RT 24 / RW 01 Serang City. Collection of LPG from PT Hasanah Karya Mandiri Agent. Consumers are RTs and Micro Enterprises with a selling price of Rp 16,000 (according to the HET set by the LG). LPG stock 3 kg dated June 19, 2018 at around 14:00 pm as many as 50 tubes. LPG stock is safe. Meanwhile in SPBE PT Erawan Multi Perkasa Abad Jl Raya Serang Pandeglang Pakima Serang City which distributes 3 kg LPG to 11 normal distribution agents 32 tons per day. "With the capacity of 50 ton tanks, the distribution of Idulfitri is up 53 tons per day, the stock is very safe," Yuli concluded. On the same day, post team from Cilegon reported, at Tanjung Gerem fuel terminal since May 2019 has been prepared to secure the stock. TBBM which has a capacity of 110,000 KL is intended for Premium, Pertamax, Solar, MFO, MDO and FAME. On June 19, 2018 stocks were recorded to supply Premium: 9 thousand KL, Pertamax: 12.7 thousand KL, and Solar: 22.8 thousand KL. Estimates of an increase in diesel consumption ahead of trucks can operate already anticipated, given the location close to the industrial area.